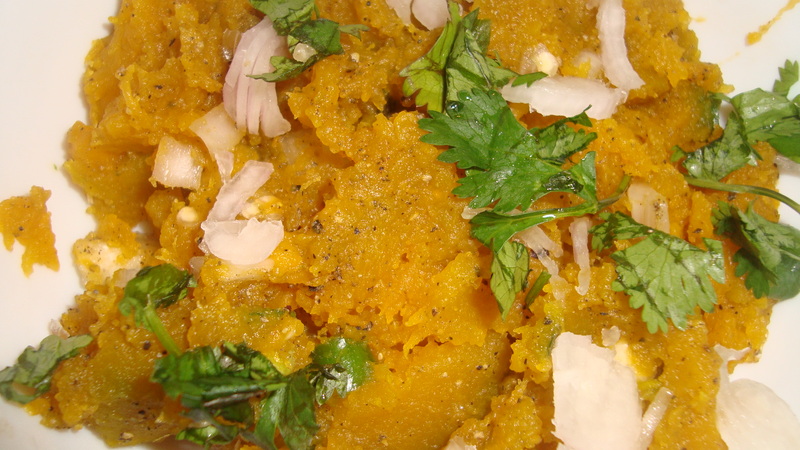 Today’s recipe is one of my mother’s simple and delicious pumpkin recipes. 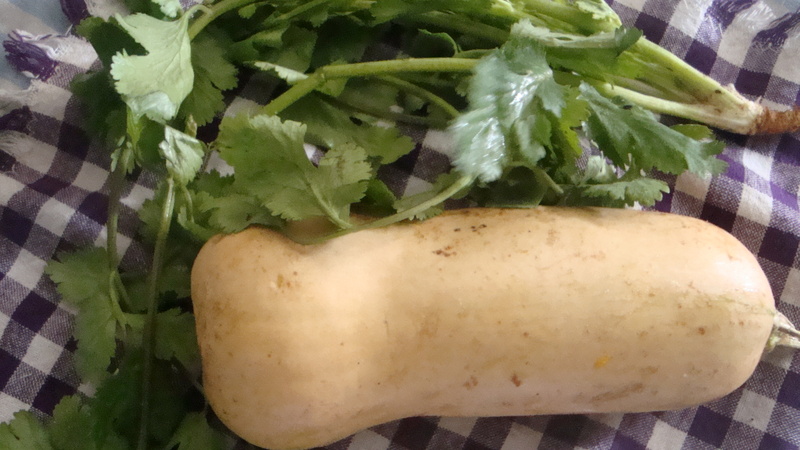 The butternut squash is called the ‘Dubai pumpkin’ for some reason in the markets of Colombo. Peel the butternut squash and chop it up into smaller chunks. Heat 1 tbsp oil in pan and fry the chopped ginger, garlic, green chilli and onion for a min or two. 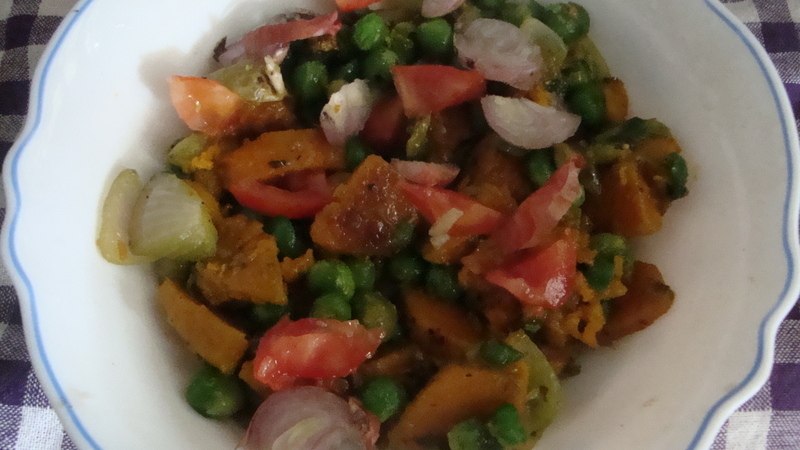 Add the chopped butternut squash and green peas to the pan and stir fry for a few mins. Add the coconut milk to the pan, as well as salt to taste, and cook for about 10 mins. Add the pepper, when the milk is about to dry up, and remove the pan from stove. 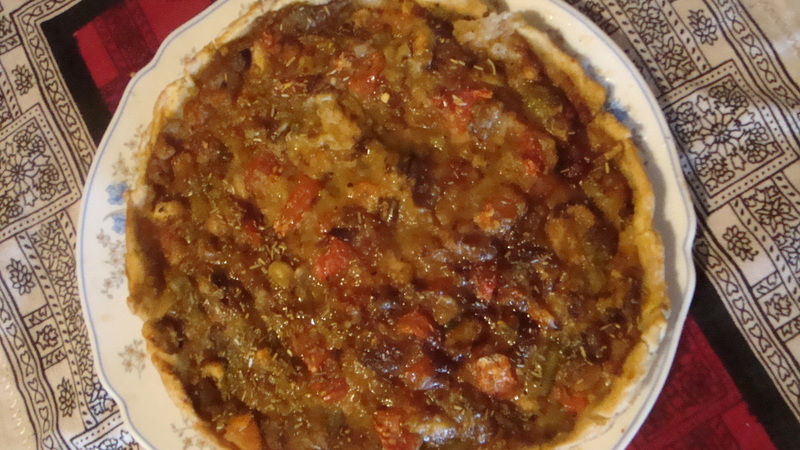 Garnish with coriander leaves, chopped onion and tomato and serve warm with rice. 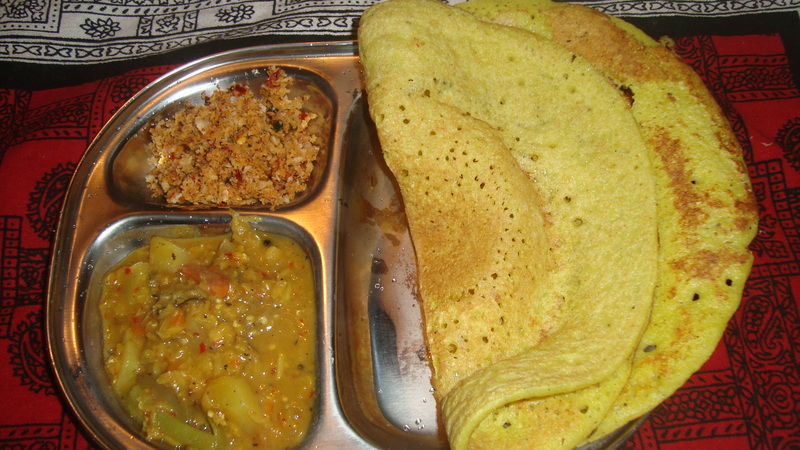 Today’s recipe is a meal that my mother often makes at home for dinner – Thosai with sambhar and sambal. This is a meal that can also be eaten at breakfast or lunch. Soak the rice, dal and fenugreek for 6 hours. Drain the soaked mixture and wash it lightly. Put the mix in the blender together with the curry leaves, chopped onion and cumin, pepper and turmeric. Blend until the thosai batter has a consistency similar to that of pancake batter consistency. Transfer the batter to a bowl. Cover and let it ferment for another 6 hours. Add salt and mix before heating up the thosai pan or flat pan. Pour a large spoonful of batter and spread it out. Flip to the other side after a minute or two so that both sides are cooked well and have brownish tinges. Serve the thosai hot with sambhar and dried red chilli sambal. Cook the vegetables, in a pan with 3 cups of water, for about 15 – 20 minutes on medium heat. Reduce heat and if water had dried up, add another ½ cup water. Add the tamarind juice, mix well and cook for another 5 minutes. Add the crushed chillies, cumin, coriander and pepper powder, crushed garlic and turmeric powder to the pan. Mix well and cook for a few more minutes. Towards the end, add ¼ cup coconut milk. Cook for a few minutes before removing from heat. Serve sambhar with thosai or idli. 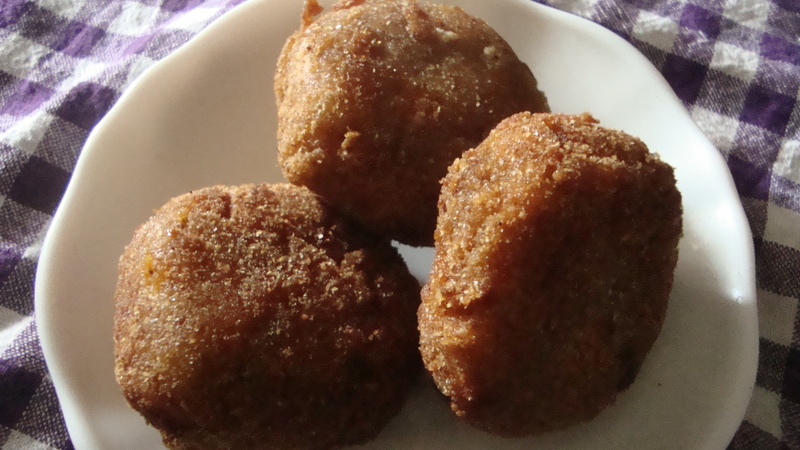 This is a simple and quick to prepare recipe of my mother’s, which is a huge hit with visitors. My mother generally likes experimenting. She can also replicate something she has once tasted. As this dish is something that falls under the two, I have labelled it under ‘Colombo’ (the city where different Sri Lankan cuisines meet) – which is also the city my mother has lived nearly three decades so far and where she feels most at home.